Hi Friends! 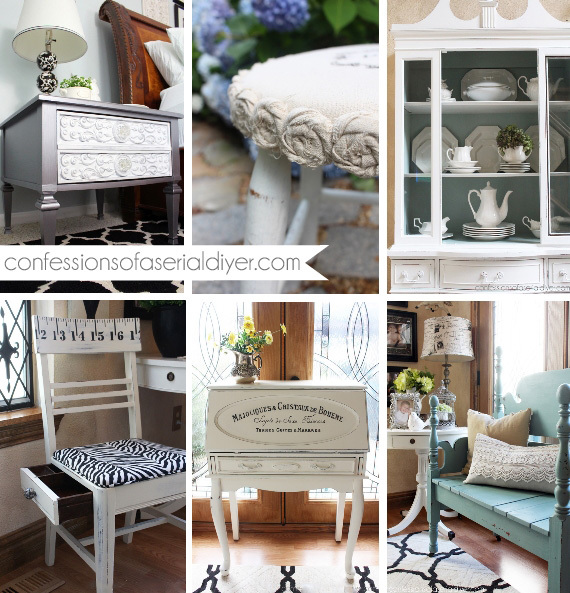 It’s time for Themed Furniture Thursday! That’s where I get together with a bunch of my furniture paintin’ friends and we all transform a piece that fits a particular theme. This month’s theme is animals. Wait until you see how creative my friends have gotten with this one! You can see those at the bottom of this post. 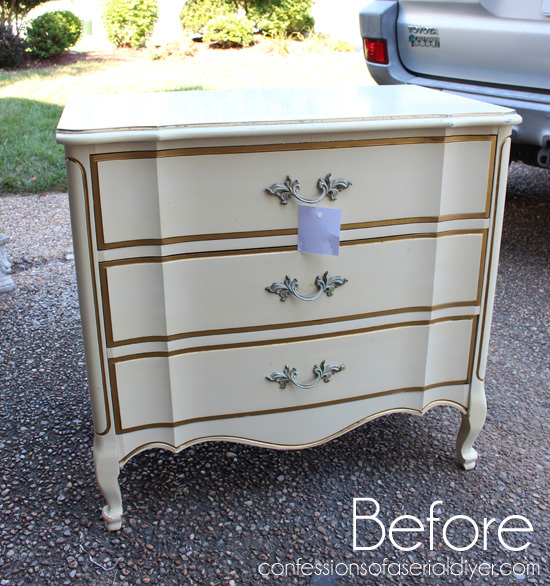 She was a thrift store find and was marked at $49, but all furniture was 40% that day yippee! So I paid around $30… not too bad. 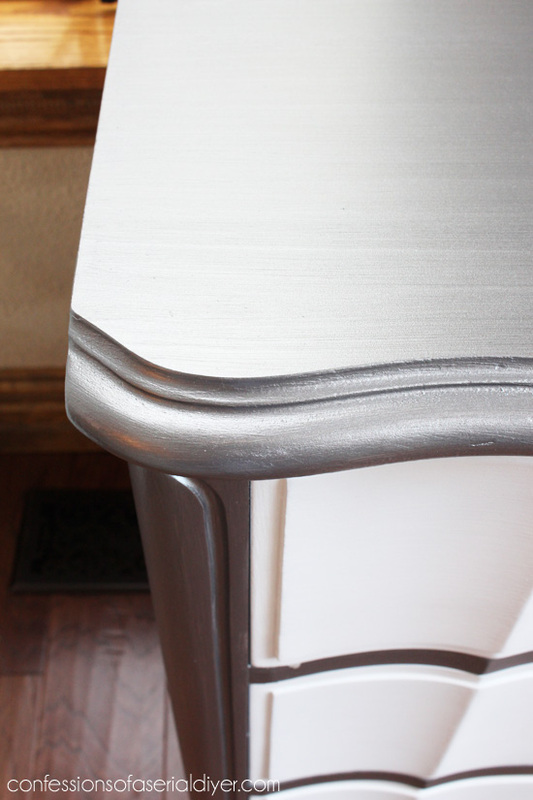 When I was considering what to do with this piece, this side table I did for our Metallic-themed makeovers came to mind right away. I knew I had some of that paint left over and it was just enough to paint this piece too! Because the original finish was that yellow/gold combination, I really wanted a look that didn’t need distressing so those colors wouldn’t show through from underneath. This is Martha Stewart’s Thundercloud. It goes on like a dream. I sanded this piece first, then primed before painting with two coats. 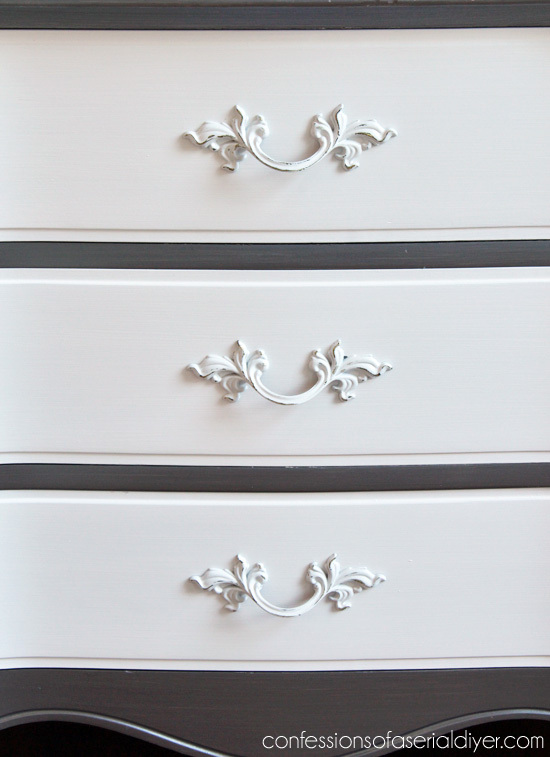 The drawers were painted in white chalk paint and sealed with clear wax. I originally purchased this color at the Home Depot, but when I went to buy more just in case what I had left wasn’t enough, they said they didn’t sell it anymore. I did find it available on their site here though, so you may be still be able to find it at a store near you. Luckily what I had on hand did the job. But wait…didn’t you say this was an animal themed makeover? SO fun! This is scrapbook paper that I found at Hobby Lobby. 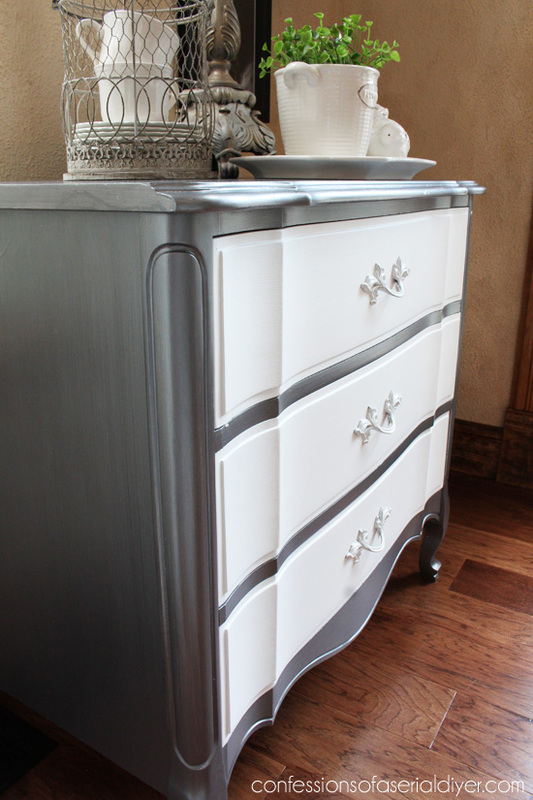 I used a glue stick to adhere it to the bottom this time around since it worked so well for the wallpaper I used on my Antique Dresser Revival I shared a couple of days ago. 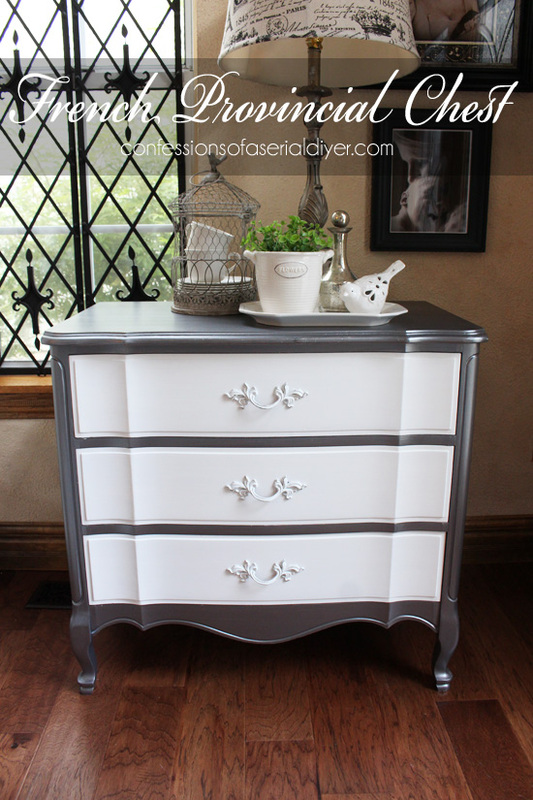 Satin white from Rustoleum made them fresh again. I sanded them a bit just to make the details pop more. This is definitely a different look for me. 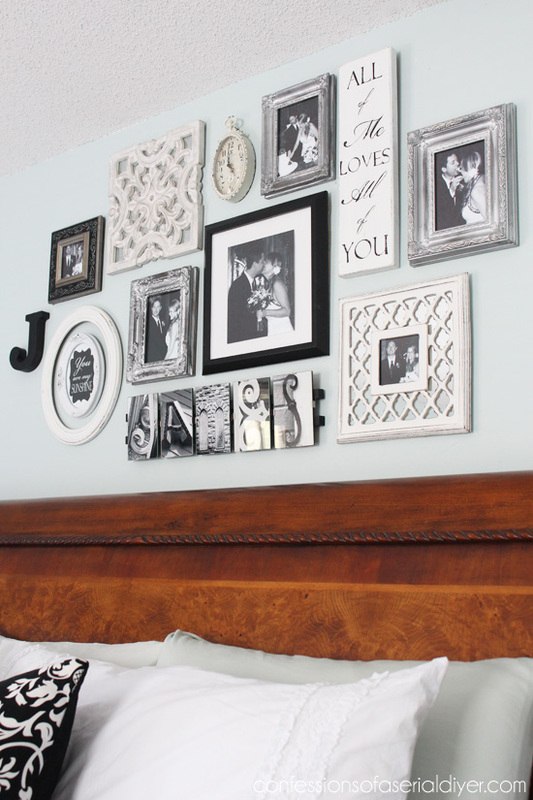 I had planned to photograph this beside my bed with my gallery wall I shared not too long ago in the background. Wouldn’t they have gone perfectly together? The problem was that I had this on my calendar for next Thursday…oops! It was around 5:30 late yesterday afternoon when I realized (thanks to my friend, Christy!) that our Themed Furniture projects were scheduled for today! Thank goodness I was working ahead this time and had my piece pretty much done, but I had to settle for where I could photograph at that hour. This turned out beautifully! I love the color choices. So glamorous with great vintage style! Wow Christy that’s stunning! 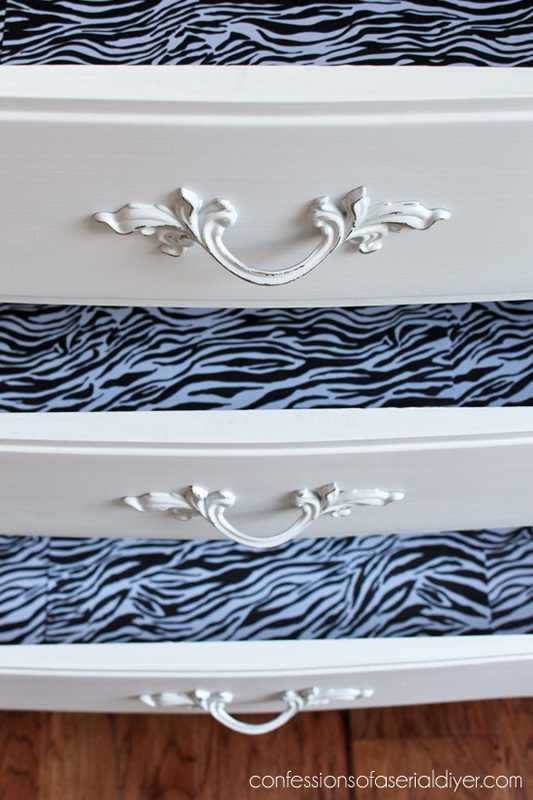 I love the animal theme inside the drawers. All of the projects here are absolutely gorgeous and fun. Maybe I’m in to animal prints more than I thought! Thanks, Heather! I am finding myself drawn to animal prints in clothes as well…I told my Mom I must be getting old because I always imagined animal prints on older ladies lol. This is so, so pretty. 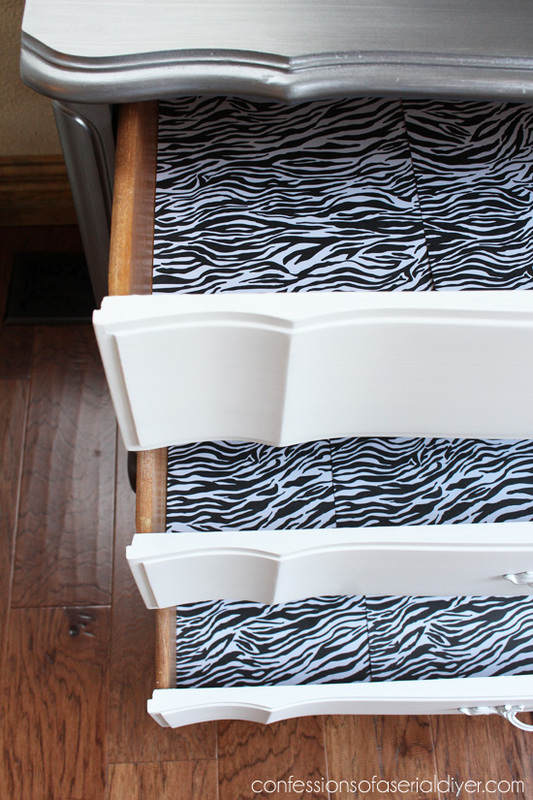 I love the “wow” factor inside the drawers! Unexpected and fun! Wow Christy, you are soooo talented!!!!! I would have never picked the silver (glad you did!) And it just looks gorgeous. I wish I lived near your area and you offered classes…..I’d be first in line lady! Great job, Christy – very classy! 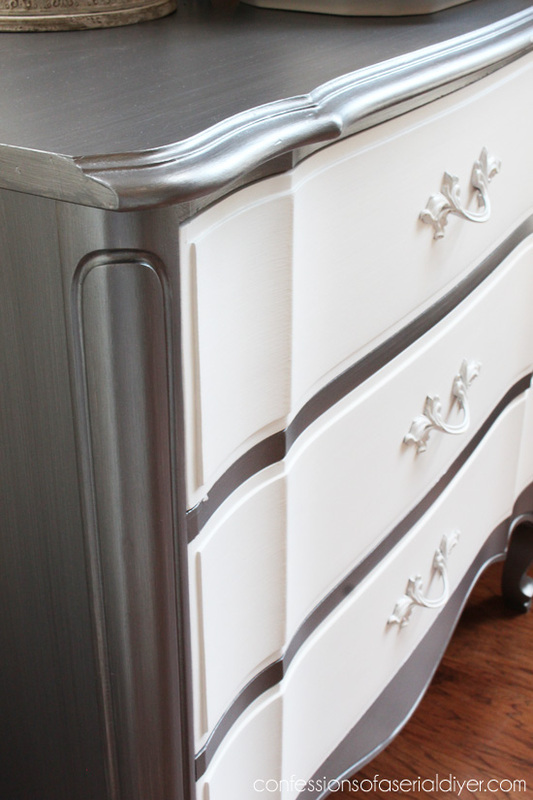 No distressing – I love it. Phew, thank goodness you were working ahead of time eh. 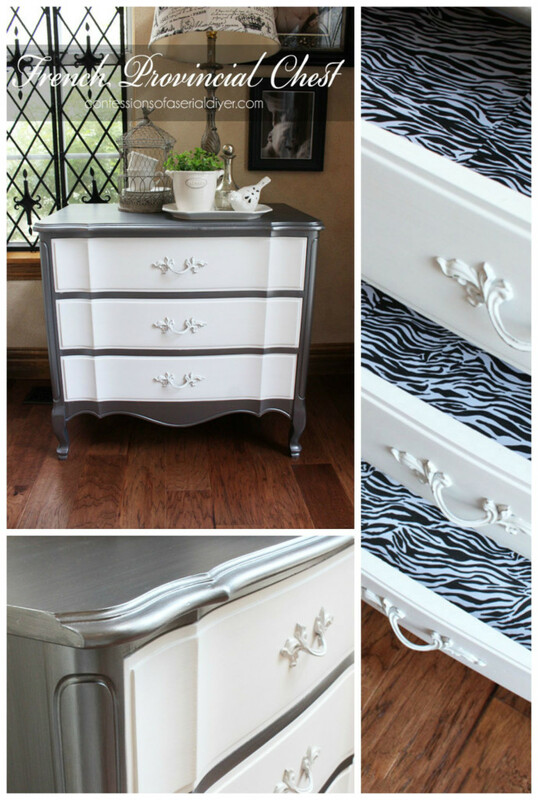 Very nice color combo and I especially love the zebra print paper lining the drawers! A glue stick huh – no ripples and bumps underneath or do you use a brayer to smooth out the glue? I know, right?? Big oops! All I had left to do was wax the drawer fronts and add the paper. 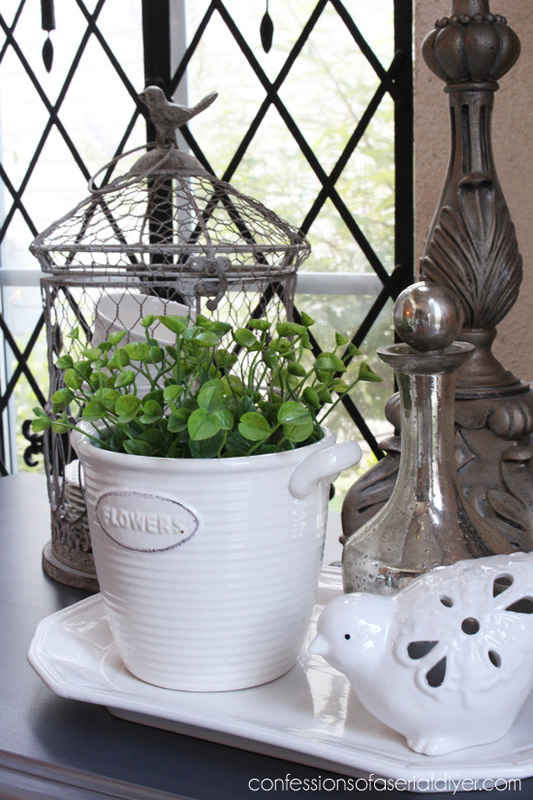 I used to mod podge it in place, but this way it can be more easily changed out later and it is less work. I use a pampered chef scraper to smooth out the paper. Sometimes I have to add another run of the glue stick in places because it dries quickly! So pretty! 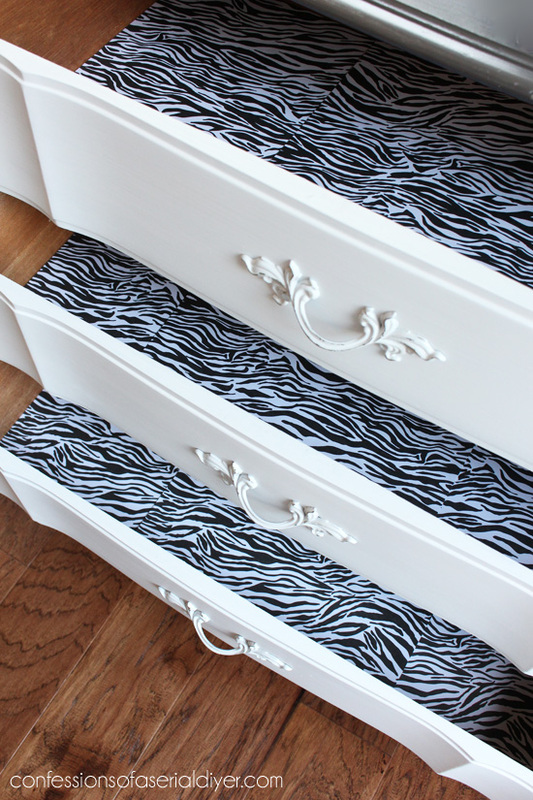 I love the color combination that you used and the surprise of the wallpaper inside of the drawers. You did a great job working outside of your comfort zone. 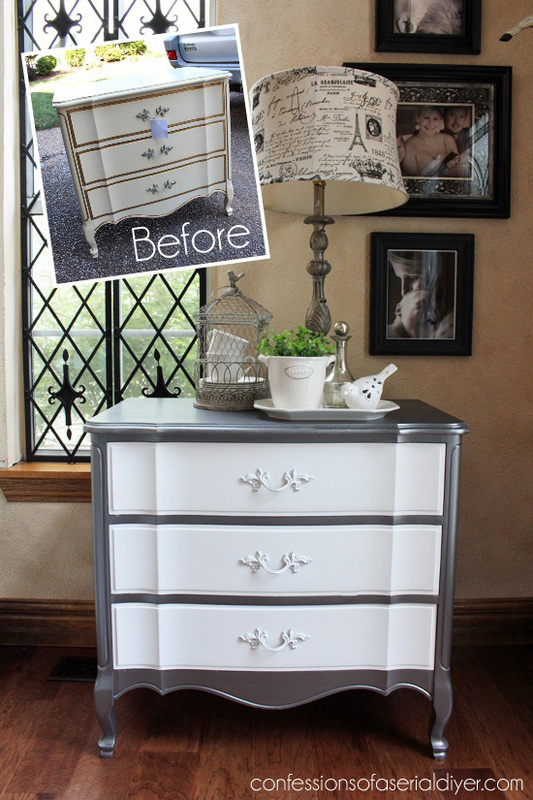 I liked the before look but the after is even better! If you lived here I would keep you busy!!! French pieces are my favorite! 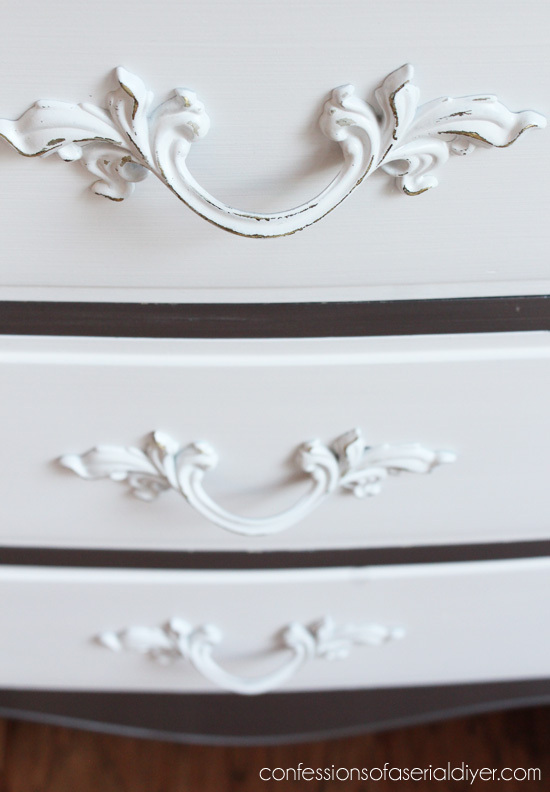 I love that you kept it classic and elegant with a touch of whimsy hiding in the drawers. Nicely done! Christy, that is a stunning piece!!!! I love the colors together. 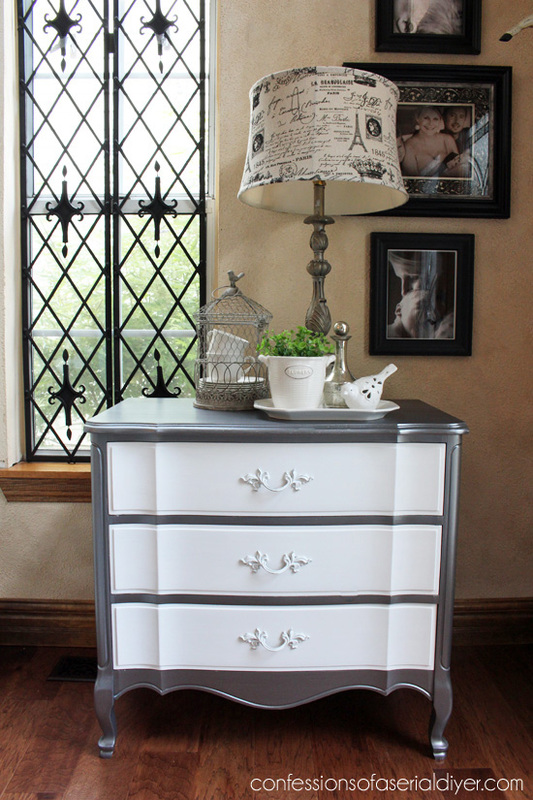 I just may need to look for something to paint the same…and add animal to the inside! 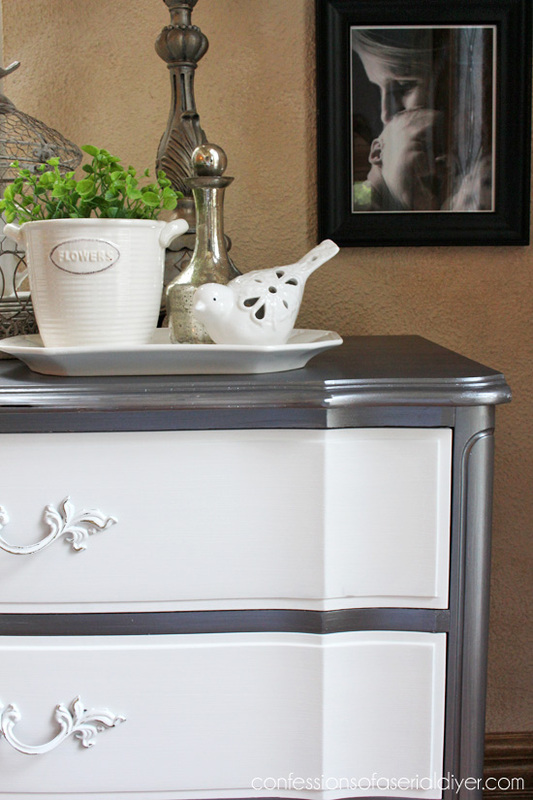 Love what you did with that French provincial chest. I feel you’ve added more elegance to it with the make-over using lighter colors! Stunning!